This topic introduces Apigee Edge Analytics Services. Video: Watch a short video for an overview of Apigee Edge Analytics Services. 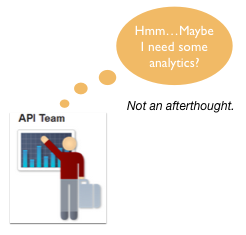 Getting complete analytics for your API program requires a few prerequisite steps. What do we mean by complete analytics? You could, for example, create an API proxy that anyone in the world could call, and Apigee will generate metrics about that API proxy. But what about metrics for the developer or app that called the API proxy? If Apigee doesn't know who made an API call (developer and app), it obviously can't generate those metrics. A few steps are therefore needed to let Apigee figure out which developers and which developer apps are calling your API proxies. The following tutorials quickly guide you through the necessary steps that let you see analytics for developers and apps: Secure an API by requiring API keys and Secure an API with OAuth. Create one or more API products, which function as security gatekeepers for API calls. See Create API products. Register developers with Apigee. See Managing app developers. Register applications and generate API keys for those developers. See Register apps and manage API keys. Add security policies to your API proxies that verify API keys and/or security tokens. See the following topics: Verify API Key policy, OAuthV2 policy, and Verify JWT policy (Beta version). If you're using Edge Microgateway, make sure that you've enabled the analytics plugin (which is enabled by default). If the analytics plugin is disabled, Edge Microgateway won't send analytics data to Edge analytics. After you complete these steps, you can use the Apigee dashboards, the Developer engagement dashboard, or generate custom analytics reports that show metrics for developers and apps. The length of analytics data retention differs by plan. Apigee Edge Analytics Services collects and analyzes a wealth of information that flows through APIs. This information is gathered, analyzed, and provided to you immediately, in real time. How is your API traffic trending over time? Who are your top developers? When is API response time fastest? Slowest? Are you attracting more developers? Geographically where do you see the most API traffic? The answers to questions like these help you improve your APIs, attract the right app developers, troubleshoot problems, and, ultimately, make better business decisions related to your API program. Let's say your API has gained wide adoption. It's popular. You have attracted a number of talented, creative app developers and people are downloading and installing their apps. Obviously, the API team is very interested in how the API is performing, how it's being used, and how to plan for improvements. What's changed? Knowing when and where something about an API changed helps you to take corrective action. What are our top apps? You need to know who/which apps are using your API. Who are our best app developers? Your best users and developers might be operating with you across multiple apps and devices, such as website, mobile apps, video game consoles, and tablets. Which API methods are most popular? Your API is a product; you want to understand its usage to help pivot your business and make future investment decisions. How much API capacity will be needed next year? Capacity planning is difficult. What if your API goes viral and you have millions of users? You need trending usage data to help make these decisions. In this context, you want to see indicators in the trend charts like the number of requests (the load hitting the backend systems), volume of data (especially for API responses), and so on. Why is the API down? There’s probably not one thing to tell you why an API is down, but the shape of your graphs can help. Do your charts show catastrophic failure or a slow lead-in to failure? Through a continual process of collecting, analyzing, and visualizing API metrics, Analytics Services helps your API team act to improve their APIs. Out-of-the-box, Analytics Services supports and encourages this pattern of collect, analyze, visualize, and act. What kind of data is collected and analyzed? Analytics Services collects and analyzes a broad spectrum of data that flows across APIs. For example, while your API is deployed, the analytics system is constantly counting and analyzing metrics like the number of messages received, number of developers, response times, errors, number of apps in use, request size, and many others. For a good introduction to metrics and how you can use them, see Use the metrics APIs to measure API program performance. For a complete listing of metrics, see Analytics metrics, dimensions, and filters reference. You can also create custom metrics by wiring together features of Analytics Services and API Services. For example, you can create a policy designed to extract certain information from an API (from request headers, for instance). Once extracted, you can use the analytics API to analyze and return the data. For example, you might ask: When does the highest response time usually occur for a specific API? The answer to a question like this might help your Ops team plan for anticipated network loads. See Analyze API message content using custom analytics for a nice end-to-end example demonstrating this technique. You've stored and collected metrics on system performance, you've collected error logs, you've collected user data, and you've collected many other kinds of data related to your business systems and the applications that run on them. Often this data is collected and stored in data warehouses where it is organized and possibly analyzed in predictable ways according to traditional models like ETL (extract, transform, load). With the rapid adoption of APIs and a mobile apps economy, understanding what to measure is less predictable than it once was. Third-party app developers have access to your APIs. Users are on the go. They have smart phones, tablets, and other mobile devices. Some may never use a browser. In this rapidly shifting environment, you need to know exactly how, when, and where they are interacting with your APIs. You need to know how your APIs are performing right now, in real time. Video: For more about this perspective, check out this short video. It explains how API data is a new breed of data, that exists at the edge of your enterprise, and that is critical to the success of your API program. Apigee encourages API teams to put analytics up front. Think of analytics as your API's peer, as an integral part of your API program from the beginning, not as something you consider or decide to add later in your API program. Analytics can provide key information at the beginning of your API program to help you improve your API and the experience of app developers who use it. As your API program matures, analytics lends insight that can inform key business decisions. Analytics Services provides several visualization tools, including the Dashboard, custom reports, GeoMap, and tools that visualize trends in API proxy performance. For now, let's take a quick look at three of these tools: the Dashboard, proxy resource performance view, and custom reports. The analytics Dashboard gives an overall view of your entire API program. You can toggle the dashboard between the API program view, which gives you a sense of overall API performance, and API top performer view, which tells you about your top performing APIs, apps, developers, and API products. You can select a time interval (hour, day, week, month) over which the data is plotted or specify a custom timespan. You can also mouse over any point on a plot to see in greater detail what was happening at that point. You also can track performance metrics for individual URIs (resources) for a specific API proxy on the Performance tab for any API proxy in the proxy editor. The custom report feature lets you select, combine, filter, and drill down into specific API metrics. You can generate reports that contain the exact data that you want to see. Reports can be viewed in the UI, exported to CSV, PDF, or PNG files. In addition, you can create your own analytics dashboard and populate it with custom reports that you select. For more information about the visualization tools provided by Analytics Services, see Analytics dashboards. For more information on custom reports, see Create custom reports. Using the Analytics Services API, you can access a wide variety of operational and business data that flows across your APIs. For example, using REST calls, you can determine which APIs are performing well or poorly, which developers are delivering the highest value traffic, and which apps are causing the most issues for your backend services. Note: The analytics dashboard is implemented using the REST API. You can use the REST API when you need to automate certain analytics functions, such as retrieving metrics periodically using an automation client or script. You can also use the API to build your own visualizations in the form of custom widgets that you can embed in portals or custom apps. The API can also be used to provide custom analytics to certain app developers or communities of app developers. To read all about the REST API for analytics, see Use the metrics APIs to measure API program performance. When you think of app developers as your customers, you'll want to make sure they have the tools and information available to them to make the best use of your API. Ultimately, you want the people who use their apps (and your products and services) to be happy. Analytics Services provides a wealth of information that app developers can use to improve their apps. App developers are not only concerned about the quality of their apps, they are very interested in your API. How is it performing? Is it error prone? Is it sometimes unavailable? How does it respond to traffic spikes? Answers to these questions are crucial to the app developer who wants to deliver the best possible experience to their (your) customers! Errors: Which API errors is my app seeing? What is the rate of errors? Where are they appearing in the code? Performance: Is the API slow right now? Which API methods are typically slow or slow at the moment? Availability: Is the API up or down right now? When will the API be back up? Why was the API down? Quota: Does your API have a quota? And as the app developer, how am I doing against the quota? Am I violating the quota? You can also create custom reports and share them with your app developers. For more information, see Create custom reports. 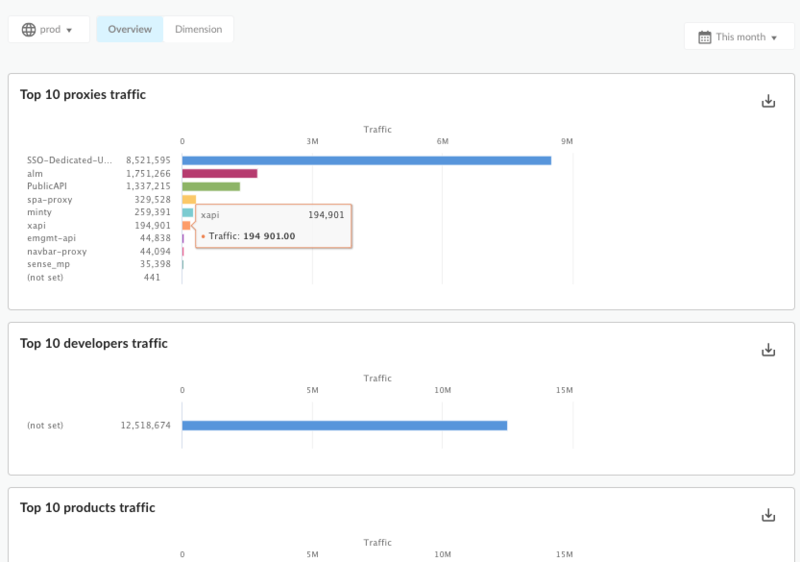 Finally, organization administrators can use the analytics management API to capture data over a wider period of time to share with app developers offline. For more information, see Use the metrics APIs to measure API program performance. With the analytics tools provided by Apigee, you can collect and monitor a lot of data, which can be overwhelming. Apigee recommends that you start slowly by collecting and analyzing a few key metrics. Use what you learn to improve your APIs and the apps that use them. As you are successful, you can collect and analyze more data to make further improvements. Ultimately, API analytics can provide a powerful 360-degree view of your entire API ecosystem and help you improve your overall business. 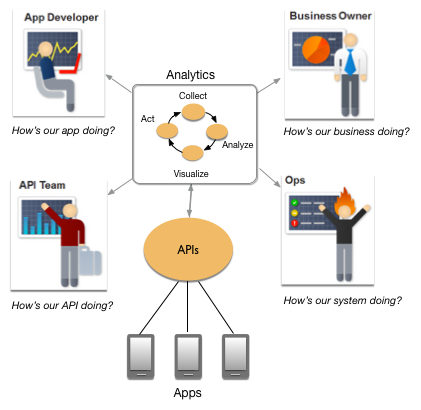 From the app developer to the business owner, API analytics help everyone improve. API Team - The API team is tapping into internal systems to create interesting APIs. The API team wants to know how the API program is doing overall, how individual APIs are doing, and how to improve their APIs. 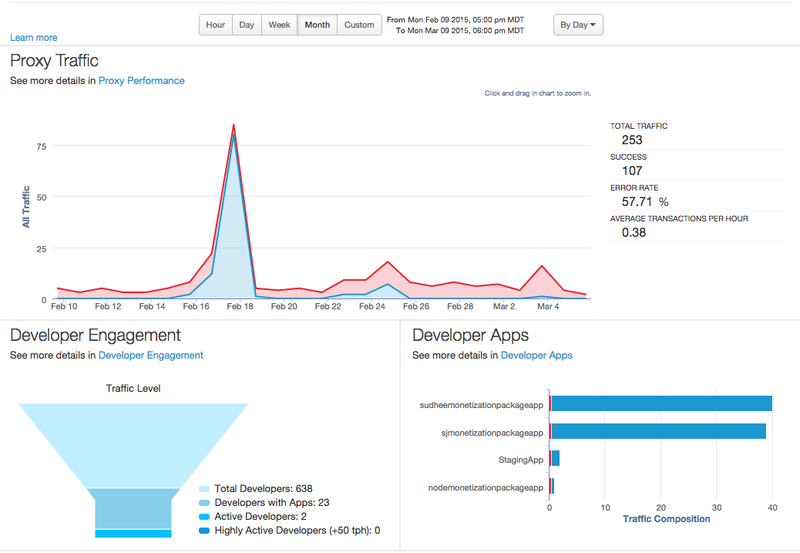 App Developers - By sharing analytics information with app developers, you get better apps. These developers are innovating with your API and building creative apps that help drive revenue to your enterprise. Analytics help app developers know how their apps are doing and how much they are contributing to the bottom line of your enterprise. App developers want to know how they can improve their apps. Ultimately, everyone wants happy end users. Ops Team - Equally, the operations team wants to understand traffic patterns and anticipate when to add backend resources or make other critical adjustments. Business Owner - The business owner wants to see how their API investment is paying off and where to invest API dollars in the future. Ultimately, the business owner wants to improve their business.